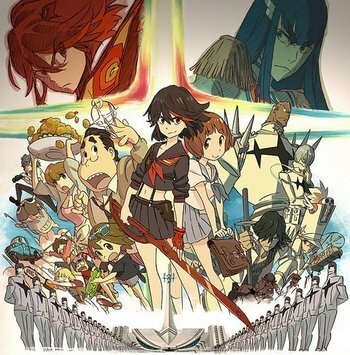 From the creators of Gurren Lagann comes Kill la Kill, an outrageous new series about the exploits of Ryuuko Matoi, and headstrong young student who wields a sword shaped like a half a pair of scissors. Her enemy is the fearsome Student council of the Hounnouji Academy, lead by Satsuki Kiryuin. The Hounnouji Academy has taken over most of Japan and rules through fear, power and an iron fist. They all wield the power of the Goku Uniforms, multi-level uniforms that are capable of giving those who possess them superpowers. Ryuuko inherits a special uniform from her father that gives her power through her own blood, and uses it to challenge Satsuki and her henchmen. Believing that Satsuki is responsible for her father's death, she seeks to challenge her and the rest of Hounnouji in order to both liberate the innocent and learn the truth.